The above derided Home Office tweet and other official Brexit communications overlook the part of the Good Friday Agreement (GFA) where the UK recognises the birthright of those born in Northern Ireland to be accepted as Irish and hold Irish citizenship. Given this recognition it is hardly compatible with the GFA to casually imply that the group of EU citizens who are NI-born Irish citizens will have to pay a £65 fee to the Home Office or be put out by the end of next year. The EU Settlement Scheme is due to open April this year, the closing date has recently shifted to June 2021, but it is tied to the end of the planned transition period in December 2020. Despite the vote against the Withdrawal Agreement at Westminster, there is no sign yet of this element of the deal being reopened. The UK plans to press ahead with the EU Settlement Scheme even if there is a no-deal, although possibly watering down its terms. It is off the table if Brexit does not happen. The Settlement Scheme will allow EU citizens in NI to retain a number of EU rights: both in relation to living in NI but also when visiting other EU member states. Whilst it could have been free the Home Office has decided to charge £65 per adult (about half for a child) for applications. It’s bad enough subjecting EU citizens from 26 countries who exercised rights to free movement in good faith having to pay what looks like a £65 fine for having come here. Irish citizens having to pay a £65 fine for having been born here to keep rights that are being removed by Brexit, would generate even more of an outcry. This option to retain EU rights won’t be open to any Irish citizen who ‘arrives’ (i.e. is born here) after Brexit day, creating an entitlements boundary between the current generation and the next. It takes a few clicks on the offending tweet to get to the ‘who should apply’ page which states that (any) Irish citizen does not ‘need’ to apply. The Home Offices position has consistently been that Irish citizens are not ‘required’ to apply under the EU Settled Status Scheme – but that equally Irish citizens “may do so if they wish”. The Withdrawal Agreement itself – which is the legal basis for the EU Settlement Scheme – applies equally to Irish citizens as it does to citizens of the EU26. There are currently a range of good reasons why NI-born Irish citizens may ‘wish’ to apply under the EU Settlement Scheme, not least as it is currently the only way of guaranteeing retaining some EU rights, for a number of reasons elaborated on below. The Common Travel Area – written in sand? The problem with this is CTA rights are currently incomplete, uncertain and insecure in legal terms – they are ‘written in sand’ in the words of the human rights commissioner. In reality entitlements of Irish citizens in NI are currently largely underwritten by EU law not the CTA. Presently, most CTA rights are in fact political promises, not law. An obvious example is that any Irish citizen here who goes on a trip outside the CTA can only re-enter into and reside in Northern Ireland because of EU law – unbelievably there is no right ‘under the CTA’ for Irish passport holders born in NI, to come back and live here after a weekend in Paris. This is a product of the UK never bringing its immigration and nationality law in line with the provisions in the GFA that allow NI-born to be accepted as Irish, if they so choose. There is therefore no ‘right’ after such a trip to come back and live here by virtue of being an Irish citizen. Hardly anyone has noticed this as the gap is currently more than plugged by EU law. But that eventually goes with Brexit. The Home Office has now realised this and slipped legislation into Westminster before Christmas to remedy this particular issue. Immigration and Social Security Coordination (EU Withdrawal) Bill, would now grant Irish citizens the rights to re-enter and reside in NI in their own right. Whilst the political promise to legislate for the CTA has been consistent it, has not happened yet and our peace process is littered with examples of Bills of Rights, Irish language acts and other theoretically binding commitments that have not been delivered. The political commitment was recently extended to some areas like social security being underpinned by a treaty, but there is no commitment to all CTA rights being treaty based or secured in a Bill of Rights or any other vehicle that cannot be changed at the whim of any future government. Both the British and Irish governments have generally wished to keep the CTA as a loose arrangement. The two governments have engaged on ‘detailed bilateral work’ on the CTA in the context of Brexit, but to date it has been behind closed doors. In contrast to the current fragile nature of the CTA, rights retained under the EU Settlement Scheme would be underpinned by a treaty in most circumstances for life. In addition, any rights under the CTA stop at the borders of the UK and Ireland. The EU Settlement Scheme will allow the retention of some other EU rights and benefits when visiting the EU. The CTA won’t. There is not even a commitment to the CTA covering any cross-border provision (e.g. schooling, education) which may only be open to those who can retain EU rights. 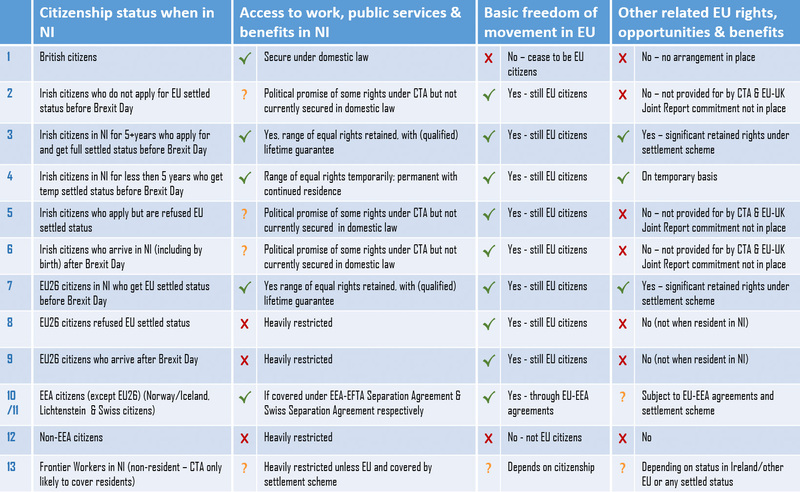 Whilst Irish citizens are still EU citizens after Brexit (any citizen of an EU member state is automatically also an EU citizen), this itself only retains some EU citizen rights – including crucially basic freedom of movement in the EU. However most other –EU rights, opportunities and benefits are dependent on residency in an EU member state, or participation in EU programmes, or coordination of social security systems. This lapses with Brexit, meaning rights to use say the European Health Insurance Card (EHIC) or pay home student rates, or have qualifications recognised, will be lost. Retaining any such EU rights requires the specific arrangements committed to in December 2017. A year on however there was nothing to implement this in the draft Withdrawal Agreement, and it is not even mentioned in the ‘Political Declaration’ on future EU-UK arrangements. Nor is it clear what ‘arrangements required’ were actually examined, if any. Both the UK Brexit Ministry and the EU’s Taskforce 50 say they hold no documents on the matter. Will the Home Office refuse EU Settlement Applications from NI-born Irish citizens? What further muddies the waters is the prospect that the Home Office may possibly try and refuse applications from NI born Irish citizens under the EU Settlement scheme, under variations of a Home Office line that such persons are to be treated as British and not Irish and therefore are not exercising EU rights. Whilst this contradicts the duties under the GFA that NI born are entitled to identify as and “be accepted as” Irish, the Home Office relies on the UK never having brought its nationality laws in line with the GFA. The British Nationality Act 1981 continues to bestow British citizenship on almost all NI born and although this does not oblige the Home Office to refuse to discharge its duty under the GFA to ‘accept’ someone as Irish if they so choose, this is what it has done in some existing cases where Irish citizens in NI have invoked EU rights to be joined by family members. This has been recently highlighted by the case of Emma and Jake DeSouza. In some cases, the Home Office has suggested that if Irish citizens in NI want EU rights they should pay £372 to renounce the British citizenship that was conferred upon them. This involves first making a GFA-incompatible declaration of being a British citizen, paying the fee, and living with the uncertain consequences formal renunciation could bring. One Belfast woman who did so recently was then asked to prove her right to live here by the Home Office. The cost of renouncing British citizenship added to the settlement fee means paying a grand total of £432 to retain some EU rights. The Home Office may choose not to refuse NI applications under the EU Settlement scheme – but if it does, as things stand this would render Irish citizens in NI possibly the only EU citizens in the UK who cannot retain some EU rights.